Executive Modern Home, Approximately 1900 Sq Ft. In The Heart Of Woodbridge. 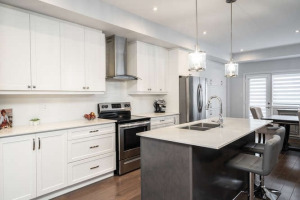 Custom Stunning Finishes Include Soaring 9' Ceilings Main Flr, Hardwood Floors & Smooth Ceilings Throughout. Gourmet Kitchen With Huge Center Island, Caesar Stone Countertops, Custom Pantry Extended Height Cabinetry In Kitchen.Upgraded Lighting, Upgraded Window Coverings.$40K Of Custom Upgrades.Unobstructed West View From Balconies. Direct Access From Garage.Perfect For Entertaining. All S/S Appliances In Kitchen. Washer & Dryer, All Electrical Light Fixtures, All Window Coverings, Central Vac & Accessories, Alarm System, Furniture Negotiable.